The weather this week in the UK made it feel like summer is actually here! (Rather gloomy this weekend but hey ho, let's hope it's on its way back!) and summer makes me think about bronzey, tanned, glowing skin. So here are a few of my favourite products to get that J Lo glow. NYX Liquid Illuminator in Gleam. This works so beautifully as a primer underneath foundation. It's not as strong as MAC strobe cream but it definitely gives a lit from within look. NARS Bronzer in Laguna. Before MAC Give Me Sun, this was my favourite bronzer of all time and I still do use it from time to time. It's quite a warm bronzer but it has little flecks of gold in it. 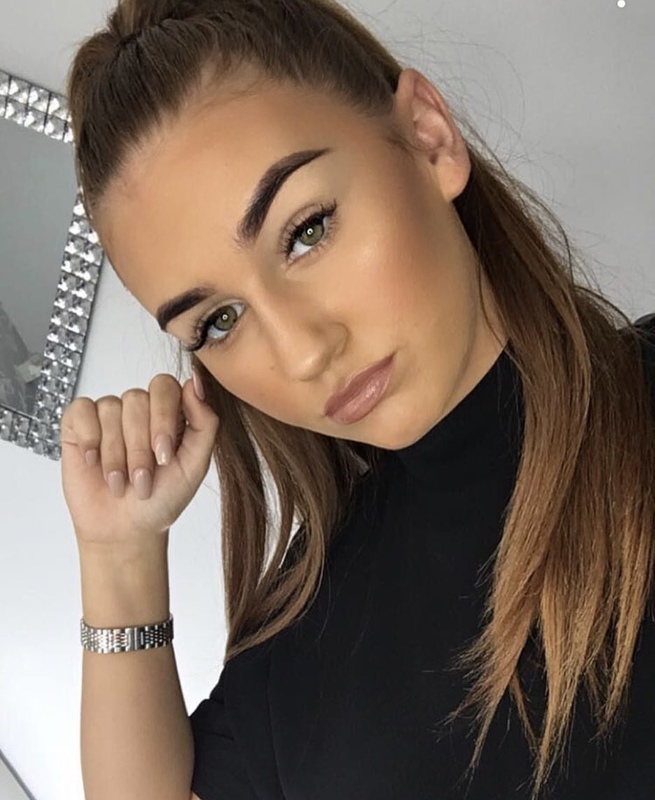 When applied it looks like a matte bronzer but in direct sunlight you can see a bit of radiance on the skin where the bronzer has been applied. A truly beautiful product. Laura Geller Baked Gelato Swirl Illuminator in Gilded Honey. My new little baby. Ever since I got this I have been using it every single day (it had replaced my Mary-Lou, something which I never thought would happen!) it's a beautiful golden highlight without being too much of a yellow gold. As the shade describes it is a beautiful honey shade, it is truly stunning and I can't wait to take this away with me! 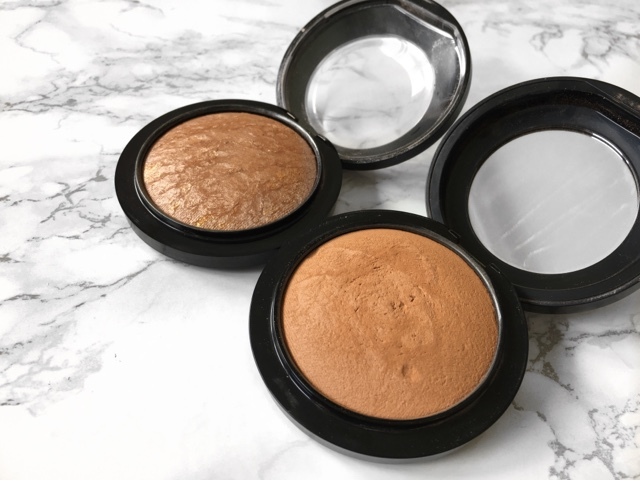 MAC Mineralize Skinfinish Natural in Give Me Sun. This particular shade is very popular and if you know me personally, you'll know this has been the love of my life since I got it towards the end of March. It looks very daunting in the pan and I wouldn't recommend it for fair skintones as it could look very orange but my god this is beautiful. I use this as my all over bronzer and it blends out like a dream and I feel like this is my number 1 staple product for that "just stepped off the beach" bronzed glow. MAC Mineralize Skinfinish in Global Glow. Now this is a highlight which used on its own on my particular skintone would look mucky as it darker than my skintone. However, that's not what I use this for. This highlight isn't as potent as highlighters such as Mary-Lou Manizer from theBalm or the Laura Geller Gilded Honey it just adds a very light glow. So what I do with this is after I've applied my MAC Give Me Sun I take this product on a fan brush and lightly (very lightly) dust this all over the areas where I have applied my bronzer just to get super glowy skin (without it being too noticable, I obviously don't want to look like I have highlighter all over my face). I don't really favour a matte finish, although I love a full coveragw, I love to look super bronzey and glowy and for my skin to look radiant and actually like skin through my makeup and this step really helps in acheiving that. 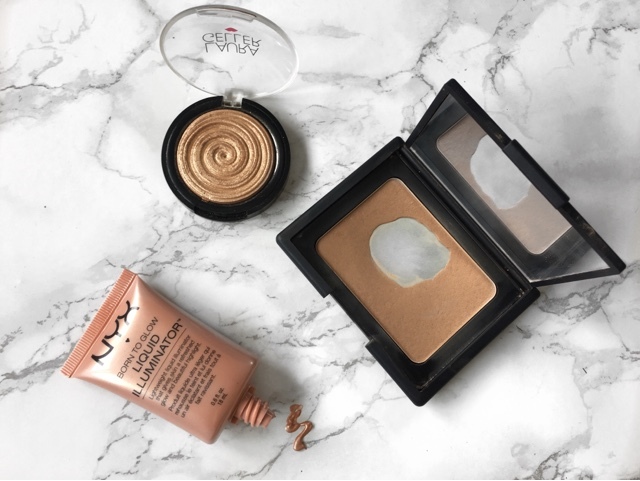 Those are my favourite products for that beachy, bronzey, glowy skin! 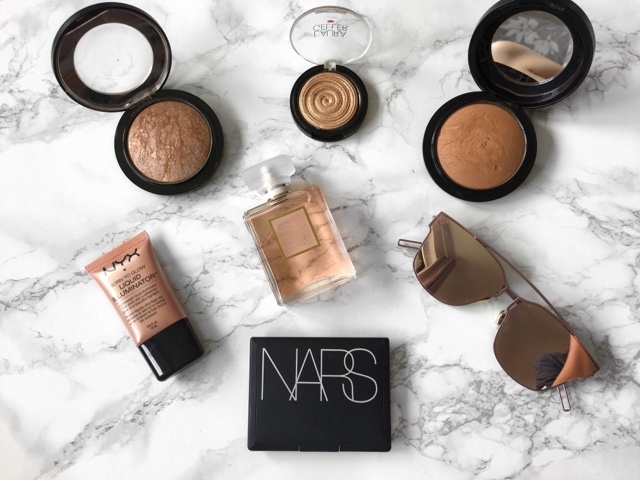 Let me know what your favourite bronzers and highlighters are in the comments below! See you soon!